Fury’s job is to charge in and send body parts flying. It does this quite well, even with all the Warlords Warrior changes. Get those big weapons, get your stuff together, and leap in. 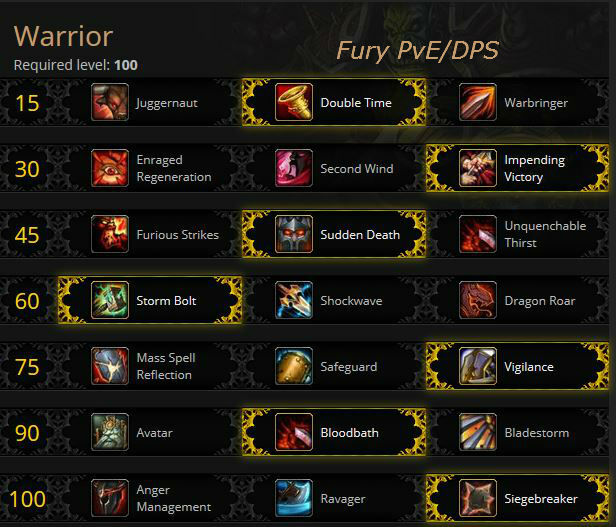 This Fury Warrior guide is primarily intended for use at level 100, for PvE and Raiding DPS. However, the same principals will also apply during the leveling process. If you’re looking for advice on leveling your Warrior, you should check out our Warrior Leveling Guide. This is the short version of the guide, there is a lot more below this section. Sudden Death for the big Execute hits. Vigilance if you’re feeling protective. Glyph of Unending Rage adds 20 rage to your pool. Glyph of Heroic Leap for faster movement after leaping. Gem for Crit, in any available slots. Enchant for Crit, including the weapon. Execute when enemy is 20% or less or Sudden Death procs. Do not cap or bottom out on Rage. The Warrior talents are all useful in at least some situations. The better you know the upcoming fights the better you can keep “the right talents” for any given situation. You will need one Tome of the Clear Mind for each talent changed. All three talents on this tier are useful and your choice should be based on the encounter. Short cooldown: Juggernaut is best used for when you need to charge on a semi-frequent basis. The short cooldown is rather nice. Double tap: Double Time is more useful when you might need a double charge for emergencies. Once you’ve burned both charges (back to back) you have the full cooldown till the next one. You only get Rage from one of the charges, unless the second charge is to a different target. .
Stun: Warbringer is for stunning adds/trash and otherwise unlikely to be a better option than the other two. The stun can act as a useful interrupt for a caster add that wander by, though. 30% Heal: Enraged Regeneration is a great on demand survivability mechanic, especially if you don’t want to add another strike to your rotation. Has the advantage of being usable while stunned. Low health: Second Wind is best used when you anticipated being low on health quite often during an encounter. Note that the heal is a Leech, so you will need to keep attacking for it to so anything. Cheap heal & strike: Impending Victory is perhaps the most useful of the three as it can be used on demand and more frequently than Enraged Regeneration for a very low rage cost. If you have room in your rotation you can use it as a filler attack. More Wild Strikes: Furious Strikes for cheaper Wild Strikes. That’s a lot more Wild Strikes. Will result in a lot less downtime in your rotation. About the same DPS overall as Sudden Death. Be careful of becoming Rage capped with this one, especially at higher gear levels. More Executes: Sudden Death gives your autoattacks a chance to proc free Executes, which can also be used on the enemy regardless of its health level. If you’re using two one-handed weapons you will get more procs, but they won’t hit quite as hard. Much more “RNG” than the others, but overall has the best total DPS. More Bloodthirsts: Unquenchable Thirst falls behind the other two in all cases as far as DPS is concerned. It removes the Bloodthirst cooldown. More Bloodthirsts = more enrages and more procs. In execute range more Bloodthirsts = more rage = more Executes. It’s easier to use and makes for a more reliable rotation, as the others are based on Procs. If you want “ease of use” over squeezing every last bit of DPS then this is a good pick. Ranged stun: Stormbolt stuns the enemy and does a small amount of damage, which is great for the adds that it works on. Against immune targets, such as bosses, it does 4x the normal damage which makes it a decent strike. Cone stun: Shockwave does nothing to bosses other than a bit of damage, but is nice for groups of adds, especially when they do enough damage to be interesting. When you hit 3+_ of ’em you get a cooldown reduction. Area damage: Dragon Roar is the best of the three for groups and is as good as Stormbolt for single target. Anything actually knocked down by your roar (it won’t be the boss) will be interrupted. Reflect: Mass Spell Reflection is somewhat useful at times, but lacking due to the fact that the majority of Raid Boss abilities cannot be reflected. Those that can are not really worth the effort. Eat his damage: Safeguard is useful as damage reduction, but you have to be wary of the damage you might take when using this ability. You charge the targeted ally and they take 20% less damage over 6 seconds, which might have occasional use, if you pay attention to other team members. Oh yes, you also eat the damage of the initial attack against him, which might be useful and which just might squish you depending on the attack. Protect him: Vigilance is similar to Safeguard in that you’re protecting the other guy, but it’s much safer for you. It does not protect him against that big hit, but you aren’t eating it. Target damage is reduced by 30% for 12 seconds and your Taunt has no cooldown. Especially useful if you’re off-tanking. Much longer cooldown than Safeguard. Rahhrrr! Avatar – Become mightier for 20 seconds. The long cooldown hurts it’s usefulness, but overall DPS is very close to that of Bloodbath for single targets. Some prefer it over Bloodbath. More blood: Bloodbath is the best of these three for single targets and multiple targets that live long enough for the bleed to be significant. It works with all your strikes and their Multistrikes. Bleeding targets are also slowed, which is occasionally useful. Area: Bladestorm is beneficial during situations where you wish to avoid losing control of your character or are fighting several mobs. Best of the three Vs groups or 2 or more, esp. if they’re fairly short lived. Reduced cooldowns: Anger Management reduces the cooldown of a number of abilities, depending on how much rage you spend. Use this if the encounter mechanics make ravager a poor choice. Some people really prefer this one though, since it’s a passive. This talent can provide the best DPS IF you’re a master of timing. Area: Ravager is the best in all area situations except where mechanics might make it unavailable or useless., such as the opposition being likely to move away from that area. Smash! Siegebreaker replaces your Intimidating shout and only affects one target, but hits that target hard and knocks him back and down. About the same as Anger Management in terms of DPS, but falls behind Ravager for most things. The first two are pretty important, the rest are situational. Pick them according to your game and the encounter mechanics. Glyph of Unending Rage is a pretty much required glyph as it adds 20 rage to your pool. Glyph of Bull Rush lets you get more rage from your charge, which is always useful. Glyph of Rude Interruption lets you do more damage after pummeling. If you’re regularly interrupting adds/caster trash then this is a very good glyph. Glyph of Death From Above for more damage (due to lower cooldown) and less mobility. Glyph of Wind and Thunder for a bigger Whirlwind radius, which is nice against larger groups. Glyph of Raging Wind gives Whirlwind a damage bonus after you use Raging Blow. Glyph of Recklessness makes your Recklessness less effective, but longer lasting. Glyph of Heroic Leap – faster movement after leaping. Glyph of Flawless Defense – Do you use Die by the Sword often? This reduces the chance for your to be crit while that is active. Glyph of the Executor – nice way to keep the Rage high when killing trash. Required: Glyph of the Subtle Defender – Your Defensive Stance no longer generates threat. Very nice if a lot of damage is coming your way and you shift to Defensive Stance for the damage reduction. Glyph of Intimidating Shout – your Fear targets stay in place instead of running. Ok, that’s odd, why Haste? Crit and Mastery play very well with each other (more enrages and more damage from being enraged,) then Multistrike can use higher base number for more damage, and Haste reduces the Bloodthirst cooldown (and other cooldowns) enough to be interesting. Versatility is very unsociable and just doesn’t interact with the others. Note that you’ll have to be really sharp with your rotation for the “exactly right” stats to be a noticeable DPS improvement. Strength, quite simply, improves everything you do that does damage. Look for Crit & Multistrike (or Mastery) on your gear. There is a Crit cap – You have a base of 10% (at level 90,) another 30% from Recklessness, and 30% from Bloodthirst, plus any other buffs you might have from your team, chemicals, etc. Any Crit over 100% is wasted. So your Bloodthirst crit cap is 30% (100% crit chance for Bloodthirst with Recklessness up) without team or chemical buffs. That first 25-30% is the most important, it’s a bit less important after that. Multistrike is much like Crit in that it’s a chance for added damage. The diff is that multistrikes can crit. You get two rolls at your % chance and any of those hits will do 30% of your regular damage. Mastery increases the damage you do while enraged and you have to Crit to be enraged, so they work well together. If you were enraged all the time then Mastery might well be #1 or 2, but it’s the Crits than will cause you to be enraged. Versatility adds to your damage, any healing that you do, and also to your damage reduction. It’s value obviously increases the more you need those last two bits, but it’ll never approach Crit. Haste has pretty much always been bad for Fury, though one might imagine a lot of Haste making you even more of the “Whirling Blades of Doom” Fury Warrior. Not so much. Partly because you can’t get enough of it at this time to be that interesting and because that much Crit will be much more useful. Also see the videos just below for a more visual rotation guide. Weapon Choice: In 6.2 it doesn’t matter much whether you go Single Minded Fury or Titan’s Grip. They’re very close in DPS. Be in Battle Stance is at all times. You can go to Defensive stance in times of heavy damage, or if off-tanking, but you’ll take a hit to your Rage generation. You want to stay enraged as much as possible and will use Berserker Rage if you suddenly calm down for some reason. Critical hits with Bloodthirst will enrage you. Try to be enraged when you use strikes like Execute. Fire off your your damage cooldowns and procs as they appear. There are some macros, below, which will fire off cooldowns as they pop up. This is a small DPS loss compared to firing them off “at the perfect time,” but makes management a lot easier. Try not to cap your rage, as that will be damage that you’re not doing. Also, try to keep your rage from bottoming out. You won’t be able to fire off a strike when you need it. With Furious Strikes or Unquenchable Thirst you’ll be able to keep up a faster pace and have fewer Rage concerns than with Sudden Death, but the overall DPS will be about the same. Use whichever “feels right” to you. Raging Blow procs from your becoming enraged, either by Bloodthirst crits or Berserker Rage. You get one use each time, two uses if you use Berserker Rage while being already enraged. Place your Ravager target and fire it right after the tank engages. Berserker Rage, if Enrage has dropped. Execute to burn Rage, preferably if enraged. Bladestorm – ideally you should have at least 6 seconds left on Enrage to get the most damage. Use Whirlwind to build Meat Cleaver stacks that will spread your Raging Blow. If an opponent is in “execute range” then use Execute on him instead of Whirlwind. Berserker Rage should be used on cooldown although it’s best to use it in combination with other damage increasing cooldowns and when you have a decent amount of rage pooled to benefit best from the 10% damage buff. To make things easier, the ability has a 30 seconds cooldown meaning it can be used many times throughout an encounter. Recklessness should be used as often as possible. Shockwave, Dragon Roar and Bladestorm are all effective AoE tools although Bladestorm is a DPS loss when used against a single target as it locks out your other abilities for the duration unlike Shockwave and Dragon Roar. Use it only when fighting larger groups. Gearing Up: Icy Veins maintains a very nice gear list for Fury Warriors, for all slots, from “just starting out at level 100” to “Best In Slot (BIS.) See it here. Rule of Thumb: When gearing look for Crit and, preferably, Multistrike for the 2nd stat. Mastery is a good 2nd as well. All of your gear will have Str on it. Don’t worry about tertiary stats (leech, sockets, avoidance, etc.) as those are uncommon and random. If two pieces are otherwise equal, and a choice is possible, go for the one with the extra stats/sockets. This one covers stats, being enraged, Rage capping, Titan’s Grip Vs Single Minded Fury, Glyphs, detailed Talents, and the rotation at around 10:00. He also uses a routine that does not include Ravager and explains why. This video covers just a tiny bit of T17 & T18 gearing, then talents (nice discussion there, by the way.) Discusses some addons at about 5:30. The “General Rotation” starts about 9:20. Gem sockets in Warlords gear are actually few and far between, having a random chance to appear on Raid gear. There are no meta gems or sockets, there are no socket bonuses, and all sockets are “prismatic,” which means that they will take any available gem. The gems themselves are all prismatic, meaning they fit into any socket. None have Str, they all have secondary stats (Mastery, etc.) There are no meta sockets or meta gems. Older (Mists of Pandaria) gems work until item level 600, but the Warlords item squish cut them down a bit. What used to be 160 Str is now 10, for example. The new Prismatic gems are 35 to 75 points of Mastery or whatever. One or two 75 pt gems will make a very small difference to your overall DPS. If your gold is tight then don’t worry about them. Or get a nice guildie to give them to you. Or see our gold page. “Greater” Crit/Mastery Taladite gems (blue) are 50 points and are a lot cheaper. Crit/Mastery Taladite gems (green) are 35 points and are cheaper still. Warlords Notes: There are no head enchants, all shoulder enchants come from the Inscription profession and are only for items under item level 600. There are new enchants for Neck, Cloak, Weapons, and your Rings. Not for any other pieces. (Not yet, anyway.) For the neck, back, and rings there are lesser enchants available that are far less expansive than the primary ones. Some lower level enchants are shown if you’re not yet 100. They cannot be applied to ilevel 600+ gear, but the new enchants can be applied to lesser gear, such as your level 1 heirlooms. In Brief: Profession bonuses are dead. Garrisons and followers with the appropriate profession trait working the appropriate profession hut are good things to have. Consider Blacksmithing, for the “no gear damage for 4 hours” buff (reg: level 2 garrison and the Blacksmithing follower, does not require the Blacksmithing skill) and save a bit on your repair bills. Even the gathering professions have some little value, though you might be better served by using those to build a larger gold stash. Your garrison will make all Warlords professions much easier. Song of the Anvil – “Your armor and weapons do not lose durability from use for 4 hrs.” Just the thing for an extended tanking/dungeoning session, right? This should save you a fair amount of gold. Solace of the Forge might be helpful when leveling/traveling through Draenor, as a molten elemental will sometimes come to your aid. Engineering will let you create a number of useful items, such as rockets, shields, a stealth device, etc. These cannot be used in raids or rated PvP, but that can be used elsewhere, such as leveling or dailies or whatever.Your follower will sell you various items, one of which is a combination bank and repair bot. Alchemy Chemistry is fun, unfortunately you can’t make acids or bombs. You can make flasks and potions to boost stats and cause other interesting effects, including a nice healing potion (a bit better than the 1st aid version.) Chemicals, however, are generally pretty cheap on the Auction House. You can also make a very nice DPS trinket: Draenic Philosopher’s Stone, requires Alchemy 500. This item is upgradable, just like the armor and weapons in the other crafts. Leatherworking Nothing for armor or weapons, but you can make Drums of Fury for a Heroism type buff (25% Haste for 40 sec.) Through the Leatherworking hut in your Garrison you can make single use tents that will increase your Str by 10% for an hour. In Mists of Pandaria the Pandarens joined the club of face-smashing goodness and that club includes all races, Warriors being equal-opportunity face smashers. In Warlords all racials having to do with Hit or Expertise are now dead. All races now bring something to the DPS table, however small it might be. Alliance: Draenei for +Str, Worgen for Crit and Sprint. Horde: Orc for the cooldown. Escape – Very nice in PvP as it allows using two DPS trinkets. Occasionally useful otherwise and can occasionally break a boss mechanic. Quickness adds to your Dodge rating, something you should have very little use for. Stoneform removes bleeds, poisons, and diseases will sometimes be useful. It also reduces damage by 10% which might also be occasionally useful. +2% critical effect on your strikes. Draenei – The males Winners of the interstellar bodybuilding contest. All of the contests. The heal is a nice ability and will help keep you topped off. A nice escape ability is great for PvP and is useful every now and then otherwise. Orcs – Orcs are generally considered to be the deadliest warrior race. Orcs possess a solid racial ability called Bloodfury, which increases their attack power by a significant amount (even more than the tailoring cloak enchant, and this is a cooldown.) Add this to a macro, along with certain trinkets, and use it to really smash face when you need to. A 5% increase to base health adds a bit to suvivability. Also useful is war stomp that gives Tauren Warriors a crucial short range AoE stun. This can also interrupt trash mobs when dungeoning/raiding. Increased XP from slain beasts is useful if you’re still leveling. Cannibalize grants undead great post-fight regeneration ability. It frees up a bag slot for normal foods, bt probably will find little use in raiding situations. Arcane Torrent restores some rage and silences nearby opponents for 2 seconds. Also interrupts non-player opponents for 3 seconds. This makes it a pretty useful ability every 2 min. Ok, you’re not yet at the level cap. Maybe you’re only level 1. Do you have a plan to hit that cap ASAP and get into that juicy end-game content? Or will you just aimlessly wander about the world, looking for the next quest, and wondering why your friends are so far ahead of you? As Fury you will easily hack endless hordes of enemies into bits, but only if you know where to go. To make your job a lot easier you should grab an in-game leveling guide for your leveling blast. With a guide you will never again wonder about where to go or what to do or what to skip and your leveling will be faster, much faster. This is true even if you boosted to 90. You’ll still have to hit those last ten levels. 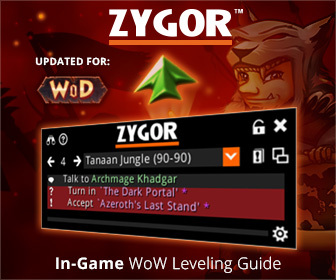 Zygor’s Guide almost automates the whole leveling path, from start to finish, for your Warrior. Carve your way through the world and the old through new content at a surprisingly crisp pace. Pick your starting point and the guide automatically updates and advances as you complete quests, sets a waypoint arrow automatically, and includes the important quest info, eliminating all doubt as to what to do next. Take a break to do some PvP leveling or dungeons and when you come back to the guide it will figure out what level you are and pick up from there. Automatically. Heck, Zygor’s will even clean up your obsolete quests for you. Fury PvP – Yeah, Fury does PvP too!